Did you Enjoy Going Through This Blog ? Do you know Jennifer Grey? For her acting or more for her “nose plastic surgery”? Jennifer Grey is an American actress. She became very popular after playing Frances "Baby" Houseman in the hit film Dirty Dancing and Jeanie Bueller in Ferris Bueller's Day Off. Grey is the daughter of actor Joel Grey and the former actress/singer Jo Wilder. Grey is the granddaughter of comedian and musician Mickey Katz. Unfortunately in recent years, Grey has become more popular, not for her work but for her nose job. She was the unlucky victim of a ruined Rhinoplasty procedure. After that nose job she looks completely different, that nobody could recognize her. Her face was so changed that her close friends failed to recognize her. Grey in her halcyon days known for her original beauty. This decision of go under a knife for a new nose was one of the worst decision of her life, because it negatively affected her career. Nobody recognize Jennifer with her new face. And she lost her identity gradually from Hollywood. And remembered for her bad nose job. It’s not that her new nose was bad but it changed her identity. “She temporarily considered changing her name changing her name to go with her new face, but stuck with her original name.” While her new nose is perfectly lovely, it is simply not her. Rhinoplasty/Nose Job is a surgical procedure which is used to repair or reshape the defected nose. It can be performed for many reasons like for cosmetic purposes or to repair the deformity due to injury or birth. This procedure is performed through the nostrils. This means there will be no visible cuts or scars. 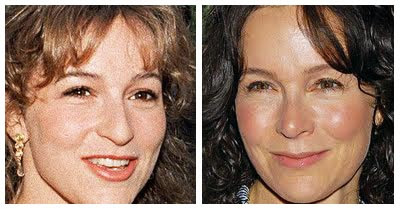 Rhinoplasty played a trick on Jennifer Grey. Plastic surgery (Rhinoplasty) is not a bad thing; In fact, plastic surgery performs miracles for those who are truly in need of it: burn victims, children born with horrible deformities, accident victims, soldiers injured in war, and the like. It is gratifying to know how far along the medical profession has come in its ability to help these unfortunate people. In ‘80s after her successful role as the ugly-duckling teenager in Dirty Dancing, she became popular in overnight. Her specialty was her bad nose but in greed of looking more beautiful, she lost her identity by performing “nose job”. She had not one but two nose jobs in the hopes that a better nose would move forward her career. Fortunately for grey, after her surgery she looks better but unfortunately no body recognizes her. This became the reason for her downfall in her career as she lost her special thing after Rhinoplasty. She is a wonderful actress. I love watching her on the screen when I have a chance. If her nose job helps her health then it was worth it. I thought she was adorable before the nose job...now she looks like any other average American on the street. 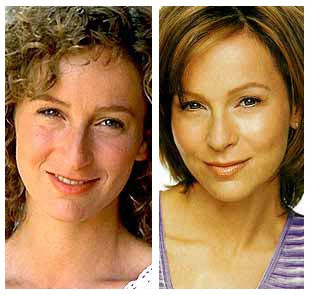 Can anyone talk about Jennifer Grey without talking about her nose job? I Think No !!!! Have Your Say !!!! I'm sure she'd be mad to know she's so heavily associated with her nose that you can't talk about one without talking about the other. I think her nose is more famous than her. If you are interested for Rhinoplasty, learn more, gather more information and take advice from your surgeon about good and bad things and make sure that it’s something you want to do for yourself. Think about whether it will actually improve how you think about your appearance. 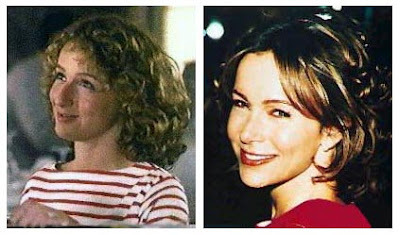 Let the Jennifer Grey plastic surgery disaster is a warning for you, if you’re considering surgery for one of your more characteristic features: There is nothing more beautiful than being yourself! The face is a little tight, but she's still pretty good looking in my mind. i NEVER recognize Jen Gray anymore! With rhinoplasty or "nose job" you can alter the appearance of the nose and to correct its shape or size. Considered a difficult cosmetic procedure, rhinoplasty should be performed by a skilled, experienced surgeon. Worst idea ever! that nose job killed her career. She is still herself, just look into her eyes! When I saw Jennifer Grey recently, I eyes couldn't believe it was the same Jennifer and that's a shame and awful when you can't recognise a person like Jennifer Grey. She looks good still but unfortunately like another person. I thought she was beautiful, with her infamous nose. Too bad she had it done, she probably felt insecure for a long time. She was a stunning woman with a unique look but her plastic surgery has ruined her. hahahhah !!! what a look !!! don't always believe on your plastic surgery !!! Jenni what you have done to your self. I have read news about Jennifer Grey was diagnosed with cancer.Sorry to here that !!! While repairing her neck ligaments, the surgeon discovered a cancerous lump on her neck. The lump was removed in two separate surgeries and Grey is now cancer-free. Good article , thanks and we want more! "ugly duckling teenager"? WTF? She did not play such a part. She played an innocent young girl that was protected and never exposed to the "other" types of people and different socio-economic levels. The whole premise of this article is that with the nose job she lost her identity. My wife has the same type of ethnic nose - that we would kid about, but I cannot imagine her getting a nose job - I am still attracted to her now as I was when we first met 23 years ago. I suggest that you interpret stories and their characters a little more in-depth. You were doing good up until that point. She looks great, I think. I'm not a huge fan of plastic surgery, but some people feel insecure - especially of their noses. It's certainly not uncommon in Hollywood. OK first of all...Her nose job looks amazing, very natural. And who cares if she got one, hey I want one so bad and I am going to get one. I don't think she had one... study the pictures. The left one caught her with her head tilted, less make up, and in different (harder) lighting. The shape and size are the same. Look closer and you will see there is no change even with the laugh lines except that the smile is bigger on the left... or does this mean to you she had plastic surgery on that too?? Haha, omg you're completely idiotic. She did have a nose job, not only does every fan of hers know what she used to look like and how she looked after the surgery (huge difference) she even admits to having one and everyone who knows her knows she has had one. You posting that you don't think she had one, when obviously she admits to it and there is a huge huge huge difference is just silly on your part. Basically if you don't know this actress, never knew her before her surgery, and are just now discovering her and stating you don't think she had one... you're crazy.. okay? Point blank: Crazy. I know her, I knew her before her surgery (she had a nose like my daughters) and now she has this completely different nose... um, she did have surgery. Look at her in the movie Dirty Dancing, and now look at her! She had the surgery not too long after making that movie, when she was younger, so check before you make silly comments that are ridiculous! Some women, though already having a good set of breasts, intend to get a fuller pair and become better in appearance. But unluckily not everyone are succeeds. I thought Jennifer a very beautiful woman before the nose job, but I thought she was just as beautiful after the nose job. One thing is certain, it's non of our business. I thought Jennifer a very beautiful woman before the nose job, I think Jennifer is just as beautiful after the hose job. One thing is certain, It's non of our business. I was a huge fan of the movie Dirty Dancing. I was a huge fan of Jennifer's and I loved her nose and her face! I remember thinking she was so very beautiful, and it was so nice to see a girl who looked so different from all the other girls on movies. I was so pleased to see so much beauty in her and her features were so unique. After she had the nose job I remember feeling so bad, I thought wow, now she just looks like everyone else, nothing special, nothing different. I had this horrible sinking feeling that the girl from the movie Dirty Dancing was gone forever. I was right, she never got to become the famous celebrity that she could have or would have been. That was the saddest moment to know I'd not get to idolize her anymore. She blended in too much now and just didn't have that cuteness people loved! She's pretty yes, but just lost that powerful pull we all had for her the way that she was. She was already perfect in my eyes.... and that is what I am sure all of her fans felt.... like she took what we loved and removed it and made herself like everyone else. :( Very sad. I watched "Strictly come dancing" with Jennifer Gray as host judge this morning, but could not recognize her at all. Dirty Dancing was the best movie ever in my eyes, and still after all these years I get carried away when listening to the sound track. Pity, she changed that much. Plastic Surgery Before And After Blog Needs Your Valuable Comments !!! What Do You Think Why People Undergo Plastic Surgery?